Professor Tsien reflects on her conflicted relationship with a classic novel in her personal essay, “The Danger of Liaisons,” Eighteenth-Century Fiction. Read more about Professor Tsien reflects on her conflicted relationship with a classic novel in her personal essay, “The Danger of Liaisons,” Eighteenth-Century Fiction. Claire-Marie Brisson has become our newest published author with her first journal publication, "Toppling Statues, Towering Walls: The Tumultuous United States in the Shadows of the Canadian Global Ideal,” due to appear in the journal Études Canadiennes / Canadian Studies N°85 (Le Canada, refuge américain / Canada: A Refuge from the United States) this December. This journal is published in Paris by L'Association Française d'Études Canadiennes. Congratulations to Alexandra Natoli, (PhD, 2016), she has won the J.B. and Maurice C. Shapiro Fellowship to conduct research at the United States Holocaust Memorial Museum. Alex Natoli,(PhD 2016) has won the J.B. and Maurice C. Shapiro Fellowship to conduct research at the United States Holocaust Memorial Museum for four months next summer toward her current project, “Bodily Matters: Remembering Outhouse Space in the Nazi Camps.” Alex has also secured a Visiting Assistant Professorship at Alfred University. Read more about Congratulations to Alexandra Natoli, (PhD, 2016), she has won the J.B. and Maurice C. Shapiro Fellowship to conduct research at the United States Holocaust Memorial Museum. 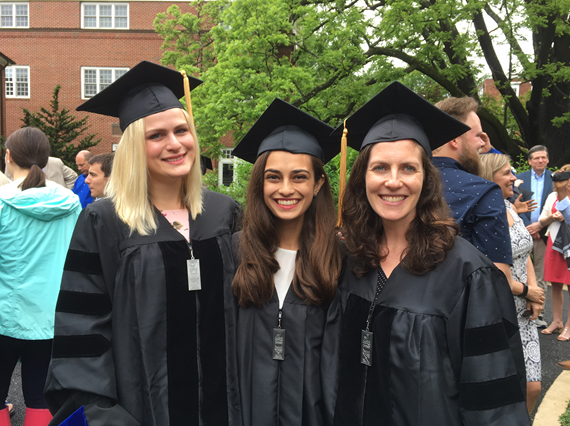 Congraulations to the French Departments 2018 Graduates: Holly Runde, PhD; Saira Sohail, MA and Hannah Holtzman, PhD. Undergraduates in all schools of the University are invited to submit 2000-2500 word essays in French on a topic concerning Franco-American relations, broadly interpreted to be any topic of a comparative nature dealing with the language, culture, politics, society, business (or some similar or allied subject) of the United States and of France or any French-speaking nation or region. The 2017-18 Praxis Fellows will present the result of their year-long collaboration working on an original digital humanities project. Praxis Fellows Presentation featuring French PhD Candidate Spryos Simotas along with 5 other Fellows will present their year long collaboration working on a digital humanities project May 4th. 10:30 am, Alderman 421. Lunch will follow. Read more about Praxis Fellows Presentation featuring French PhD Candidate Spryos Simotas along with 5 other Fellows will present their year long collaboration working on a digital humanities project May 4th. 10:30 am, Alderman 421. Lunch will follow. 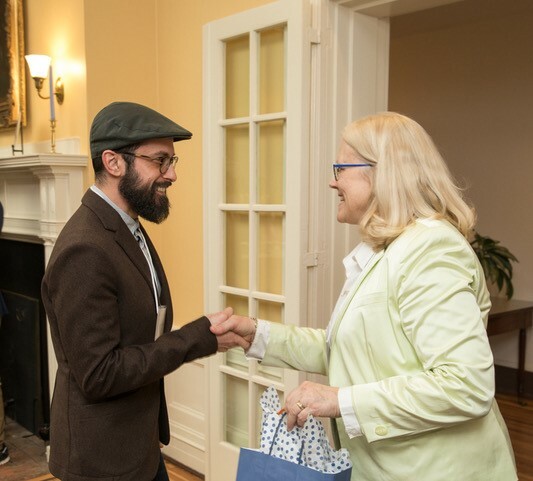 Spyridon Simotas receiving a 2018 All-University Graduate Teaching Award from Beth J. Beal, Office of Graduate and Postdoctoral Affairs. Photo Credit: Melody Robbins Photography." UVA and Sciences Po alum Scott Tilton has submitted an official bid for his home state of Louisiana to become part of L’Organisation Internationale de la Fracophonie. Click here to see his TV5 Interview . Read more about UVA and Sciences Po alum Scott Tilton has submitted an official bid for his home state of Louisiana to become part of L’Organisation Internationale de la Fracophonie. Congratulations to PhD Candidate Hannah Holtzman, whose article on "A fifty-two-year love affair: rewatching Hiroshima mon amour after Fukushima” has appeared in the April 2018 issue of Contemporary French Civilization (Volume 43, Issue 1) ! Read more about Congratulations to PhD Candidate Hannah Holtzman, whose article on "A fifty-two-year love affair: rewatching Hiroshima mon amour after Fukushima” has appeared in the April 2018 issue of Contemporary French Civilization (Volume 43, Issue 1) !